The Bad Witch's Goddess of the Week is Artemis, Greek goddess of wild places and wild animals - including the bear, the lion, the wolf and the hare. She was traditionally seen as a huntress, armed with her bow and accompanied by her pack of hounds. Although many modern pagans, quite rightly, are opposed to hunting wild animals for sport, the concept of the huntress can be applied to many things such as pursuing a goal or tracking down some elusive object of desire. As well as being the patron of wild creatures, she is also associated with fertility, the moon, healing, protection and vengeance. For many witches these days she is a powerful symbol for independent and strong-willed women. I also see her as the goddess of photographers - especially when I am trying to photograph wildlife. The skills needed to capture some elusive wild creature in a photograph are, after all, exactly the same as those needed by a huntsman - or huntswoman. "Artemis is a goddess of many things, she is a virgin goddess who is also a goddess of women and of fertility, in ancient Greece she was viewed as the goddess of song and dance, a goddess of water who held the title of Lady of the Lake, she was a goddess of the sun and of the moon, of day and of night, seen and depicted as a warrior goddess by the Amazons and interacted on many levels with both the other gods and mortals in the various myths and sagas." I decided to pick Artemis as my goddess of the week because she is one of the many goddesses associated with hares, which I wrote about on A Bad Witch's Blog yesterday. appeared. They followed it until it went to ground by a myrtle tree - which is where they built a temple to Artemis. In another story, Artemis was so angry when a group of Greek sailors killed a hare that she delayed them on their journey to the Trojan war. 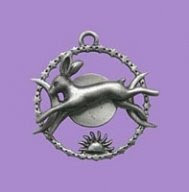 The picture at the top right shows a celestial hare pendant, which is available from online pagan retailer Pagan Magic for £9.99. Pagan Magic also sells a beautiful pendant depicting Diana the huntress - the Roman equivalent of Artemis - for £6.99.